Overlooking the Arno river and Oltrarno area, enjoy memorable views and a location right in the heart of the historic center. The apartment is located in the most central historic center location. You can be at the entrance to the Uffizi Gallery in just two minutes, stroll the Ponte Vecchio at your doorstep. Enjoy the convenience of a location that is second to none when it comes to views and acessibility to the sites. The apartment building is on tiny Piazza del Pesce at the foot of the Ponte Vecchio bridge. Uffizi Gallery is one block away. Sunlight streams through the completely unobstructed windows and views from the living room, dining room and both bedrooms. The apartment is roomy and very comfortable, furnished to a high standard. The living room is large and graciously appointed with two sofas and three comfortable armchairs. Parquet floors throughout the living room and dining room. Wall-to-wall terrace doors are southward facing and open out onto a small terrace. 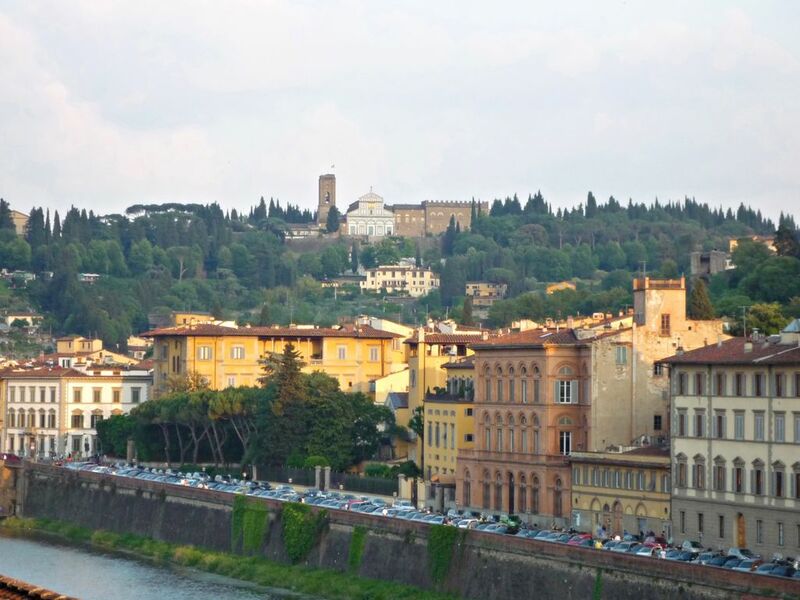 The terrace is delightful for taking in the stunning views of the Arno and Oltrarno views. It is furnished with a table and two chairs. There is a TV with satellite in the living room. Off the living room is a combination dining room with a large window with stunning views and. An expandable dining table can seat up to 12 people. There is a desk in this room, a handy workspace if needed. The master bedroom has a dual king size bed which can be prepared together or individually as two twin beds, wall-to-wall closet with lots of storage space and polished terrazzo floors. The second bedroom has two twin beds (not combinable), also with ample closet space and hardwood floors. Off the hallway are two bathrooms. One with toilet, sink, shower. The other with bathtub with shower sprayer attachment, toilet, sink, bidet. There is air conditioning in the living room, dining room, both bedrooms and the kitchen. There are screens on the bedroom windows. The kitchen is fully equipped and has a large refrigerator, separate freezer, dishwasher, microwave, 5-burner gas stove, electric oven, Italian espresso pot and drip coffee maker, toaster. The laundry room has a washer, dryer and sink. This property is offered by Italy Perfect. We are a family business with a mission! We want you to love Italy as much as we do. We are based in North America, we can answer your questions in English or Italian. We look forward to hearing from you! Heart-pounding views and a terrace! Major historic sites are at your doorstep. Wonderful views. Terrace off the living room with table & 2 chairs.